Et utvalg av vitenskapeilge artikler om værmodifikasjon. Full oversikt. Scientific Paper by J. Marvin Herndon, PhD: Scientific Misrepresentations and the Climate-Science Cartel (cl Journal of Geography, Environment and Earth Science International, 2018, 18(2), 1-13. Scientific Paper by Mark Whiteside, MD, MPH and J. Marvin Herndon, PhD: Previously Unrecognized Potential Factors in Catastrophic Bee and Insect Die-off Arising from Coal Fly Ash Geoengineering (click here); Asian Journal of Biology, 2018, 6(4), 1-13. Scientific Paper by J. Marvin Herndon, PhD, Dale D. Williams, MS, and Mark Whiteside, MD, MPH: Previously Unrecognized Primary Factors in the Demise of Endangered Torrey Pines: A Microcosm of Global Forest Die-offs (click here); Journal of Geography, Environment and Earth Science International, 2018, 16(4), 1-14.
Review Article by J. Marvin Herndon, PhD, Mark Whiteside, MD, MPH, and Ian Baldwin, MA: Fifty Years after “How to Wreck the Environment”: Anthropogenic Extinction of Life on Earth (click here); Spanish; Italian; Journal of Geography, Environment and Earth Science International, 2018, 16(3), 1-15. Medical Paper by Mark Whiteside, MD, MPH and J. Marvin Herndon, PhD: Aerosolized Coal Fly Ash: Risk Factor for COPD and Respiratory Disease (click here); Spanish; Journal of Advances in Medicine and Medical Research, 2018, 26(7), 1-13. Scientific Paper by J. Marvin Herndon, PhD, Raymond D. Hoisington, and Mark Whiteside, MD, MPH: Deadly Ultraviolet UV-C and UV-B Penetration to Earth's Surface (click here); French; Spanish; Journal of Geography, Environment and Earth Science International, 2018, 14(2), 1-11. Medical Paper by Mark Whiteside, MD, MPH and J. Marvin Herndon, PhD: Aerosolized Coal Fly Ash: Risk Factor for Neurodegenerative Disease; Spanish; Journal of Advances in Medicine and Medical Research, 2018, 25(10), 1-11. Journal of Geography, Environment and Earth Science International. J. Marvin Herndon, Mark Whiteside and Ian Baldwin. Fifty Years after “How to Wreck the Environment”: Anthropogenic Extinction of Life on Earth. Journal of Advances in Medicine and Medical Research. (Past name: British Journal of Medicine and Medical Research). Mark Whiteside and J. Marvin Herndon. Aerosolized Coal Fly Ash: Risk Factor for COPD and Respiratory Disease. Journal of Advances in Medicine and Medical Research, 2018, 25(4), 1-10. Contamination of the Biosphere with Mercury: Another Potential Consequence of On-going Climate Manipulation Using Aerosolized Coal Fly Ash. A New Concepts in Global Tectonics Journal. Open Letter to Members of AGU, EGU, and IPCC Alleging Promotion of Fake Science at the Expense of Human and Environmental Health and Comments on AGU Draft Geoengineering Position Statement. French Journal of Geography, Environment and Earth Science International. Evidence of Variable Earth-heat Production, Global Non-anthropogenic Climate Change, and Geoengineered Global Warming and Polar Melting. An Indication of Intentional Efforts to Cause Global Warming and Glacier Melting. Further Evidence of Coal Fly Ash Utilization in Tropospheric Geoengineering: Implications on Human and Environmental Health. J. Marvin Herndon Ph. D.
ADVERSE AGRICULTURAL CONSEQUENCES OF WEATHER MODIFICATION. Indian Journal of Scientific Research and Technology. Obtaining Evidence of Coal Fly Ash Content in Weather Modification (Geoengineering) through Analysis of Post-Aerosol-Spraying Rainwater and Solid Substances. Harald Kautz-Vella: Norge 2012. Theoretical and experiementally proven negative effects of (Ba, Srx, TiO3 nano particles on plant growth. Resultat av analyse of flydrivstoff gjort på hovedflyplassen i Zurich, Svets i 2014. Informasjon hentet fra dokumentar filmen Overcast. Dette er kun noen få eksempler på funn som har blitt gjort ulike steder i verden. For stor versjon, klikk på bildet. Nivå av aluminium, 38mg/liter dette er altså 38’000 mikrogram/liter! Normal verdier i regnvann er mellom 10 and 1200 mikrogram. Normalt skulle det verken vært barium (440ug/l) eller strontium (260ug/l) i en slik regnvannsprøve. Link til artikkel. 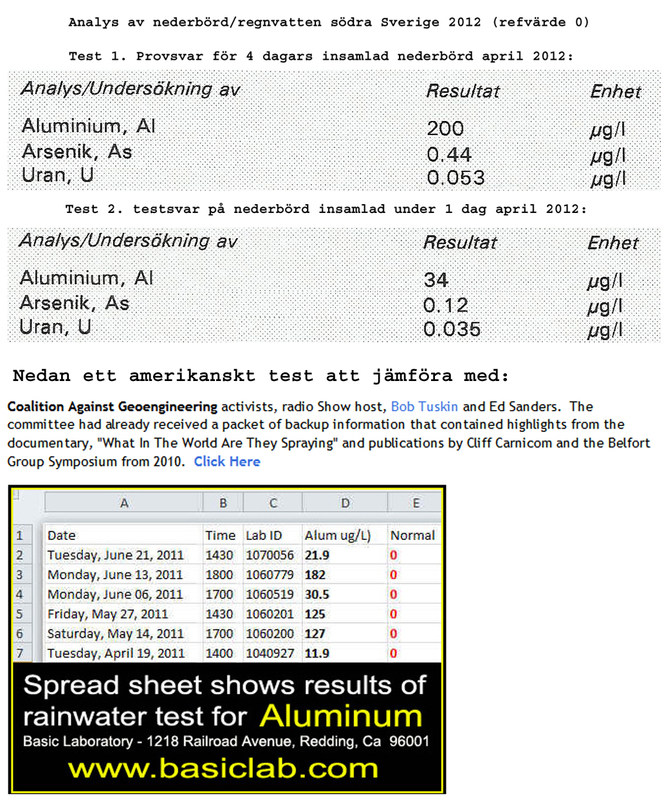 Her er aluminum 6,400x høyere enn grenseverdien, jern er 28000x over grenseverdi, magnesium is 5.3x over, kalium er 793x over, natrium er 15.9x over. Link til artikkel. Forhøyede verdier av aluminium. Dessuten funn av barium og bor. Link til artikkel. Høye verdier av Aluminium, Arsenikk og Uran! - i vannprøve. Sammenligning med verdier av aluminium i prøver fra USA. Meget høyre verdier av aluminium og strontium.